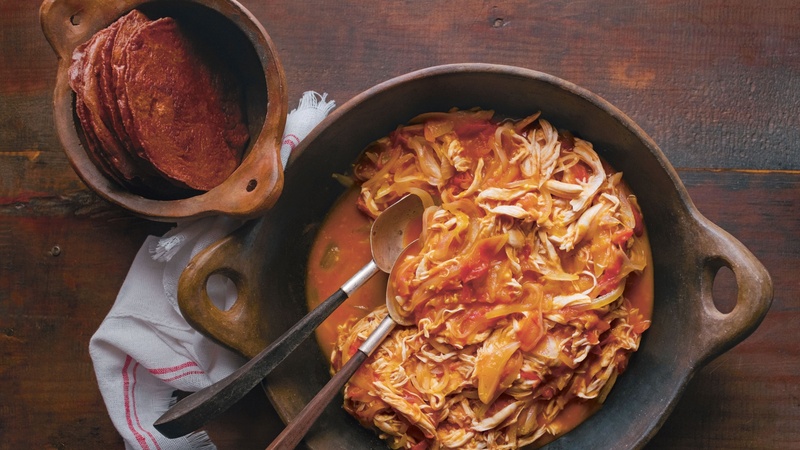 "The first recipe any Mexican will cook as soon as they move out of their parents' home and live on their own is chicken tinga." Writes Enrique Olvera in his new cookbook Tu Casa Mi Casa. "It is easy, reminds everyone of home, and the ingredients are very accessible. Although it is better made with dried chipotle chilies, canned chipotles work if in a pinch. It can be a soupy stew served over white rice and with tortillas. If you cook it down to thicken a bit more, it is a great topping on a tostada with fresh shredded lettuce, some crema, cheese, and fresh salsa." In a medium pot, combine the chicken, onion halves, whole garlic cloves, and 1 tablespoon of the salt. Add water to cover and bring to simmer over medium-high heat. Simmer, uncovered, until the chicken is cooked through, 30-40 minutes, skimming occasionally to remove impurities. Remove the chicken from the broth and let rest until it is cool enough to handle. Using your hands, pull or shred the chicken and reserve. Strain and reserve the broth as well. In a medium to large pot, heat the oil over medium heat. Add the sliced onion and garlic and cook until translucent, about 5 minutes. Add the reserved shredded chicken, the chipotle chilies, tomatoes, and 240ml of the chicken broth (reserve the rest for other preparations). Cook until the tomato breaks down and changes to a brick colour, 5–10 minutes. Season to taste with salt. Add some more cooking broth if necessary; it should be a bit soupy. Serve hot or let cool and refrigerate for up to one week or freeze for up to one month in an airtight container.